The tremendous flow of air traffic traversing the airspace of the European Union demands extraordinary vigilance on the part of air navigation service providers. Although the first requirement of air navigation services is obviously the enhancement of safety, providers must also attend to the efficiency and optimisation of airspace capacity and the minimisation of air traffic delays. As technological and operational improvements proceed in these areas, jurisdictional issues of responsibility and liability—particularly in cases of mid-air collisions—become ever sharper and more in need of precise definition. prospects for the imposition of a transparant liability regime on corporatised air navigation service providers. 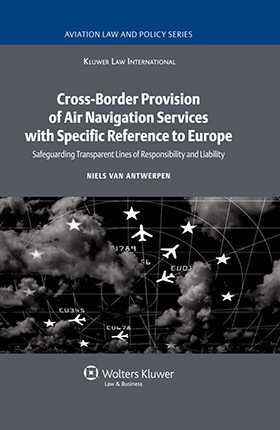 In conclusion, the author enumerates the essential elements required for cross-border provision of air navigation services and offers well-thought-out final recommendations and conclusions on the most preferable way to pursue such cross-border provision within and outside the European Community. A model agreement for the delegation of air navigation service provision appears as an appendix. All professionals concerned with air navigation, in Europe and elsewhere, will appreciate the depth of knowledge and commitment apparent in this book. The deeply informed insights manifest in its pages will be of enormous value to aviation agency officials and air law practitioners everywhere. Table of International Conventions and other Agreements. 2. The International Legal Framework. 3. The European Legal Framework. 4. Cross-Border Provision of Air Navigation Services. 5. Organisation of Air Navigation Service Providers in Europe. Appendix I: Model Agreement for the Delegation of Air Navigation Service Provision.